This article is about the archaeological site in the Machupicchu District, Urubamba Province, Cusco Region, Peru. For other uses, see Inti Watana. The Intihuatana of Machu Picchu was carved directly into the bedrock of the mountain's summit area. It is characterized by complex surfaces, planes and angles whose purpose at this time is unknown. Incomplete descriptions of its purpose by the Inca in their chronicles only add to its mysterious existence. Archeological explanations which are not currently mainstream assert that the Inca did not construct Inti Watana but rather found it, along with other mysterious structures pre-existing at Maccu Picchu. This implies a problematic consideration, that the Inti Watana's construction was done by an as-yet-unknown, apparently highly advanced earlier civilization. Current archeological thought has no rigorous explanation whom this earlier culture could have been. Featuring a slightly inclined plane at its top, an upright stone column tilts 13 degrees northward. Other features include a granite block resembling a carved shelf, bench, or altar, and a rectangular base. Possibly used as a sundial, it was aligned with the sun's position during the winter solstice. The Inca believed the stone held the sun in its place along its annual path in the sky. At midday on the equinoxes the sun stands almost above the pillar, casting no shadow at all. On June 21, the stone is casting the longest shadow on its southern side and on December 21, a much shorter one on its northern side. The base is said to be "in the shape of a map of the Inca Empire" but most archaeologists disagree, observing that the base is squat and stubby whereas the Tawantinsuyu is long and thin. Pedro Sueldo Nava describes the landmark as "perhaps one of the most beautiful and enigmatic places to be found in Machu Picchu." ^ "Machu Picchu History". www.destination360.com. ^ "Pachacuti Inca Yupanqui - Inca emperor". britannica.com. ^ Amao, Albert (23 January 2012). The Dawning of the Golden Age of Aquarius. AuthorHouse. pp. 79–. ISBN 978-1-4685-3753-6. Retrieved 19 July 2012. ^ a b Krupp, E. C. (5 August 2003). Echoes of the Ancient Skies: The Astronomy of Lost Civilizations. Courier Dover Publications. pp. 48–. ISBN 978-0-486-42882-6. Retrieved 19 July 2012. ^ Blacker, Maryanne (1 September 2010). DK Eyewitness Travel Guide: Peru. Penguin. pp. 181–. ISBN 978-0-7566-8326-9. Retrieved 19 July 2012. ^ Zecharia Sitchin (31 October 2011). "Zecharia Sitchin - The Lost Realms". slideshare.net. ^ Amao, Albert (24 January 2012). The Dawning of the Golden Age of Aquarius: Redefining the Concepts of God, Man, and the Universe. AuthorHouse. p. 78. ISBN 978-1-4685-3752-9. Retrieved 16 July 2012. ^ a b Jenkins, Dilwyn (1 October 2003). Rough Guide to Peru. Rough Guides. p. 175. ISBN 978-1-84353-074-9. Retrieved 16 July 2012. ^ Nava, Pedro Sueldo (1976). A walking tour of Machupicchu. Editorial de Cultura Andina. pp. 33–4. Retrieved 16 July 2012. 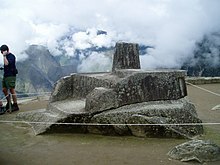 Wikimedia Commons has media related to Intihuatana (Machu Picchu).